It isn’t surprising to say that UFone always hits the conscience of the subscribers with some great surprise! Here comes another amazing scheme in the form of UPaisa, which is not just a money transfer service, but a lot more. All the services offered under the umbrella term of “UPaisa” are comparatively easy, secure, cheap, reliable and quick. Besides money transfer, you can pay bills of all the national and regional utility billing companies, such as gas, water, internet, electricity and telephone. If you become a UPaisa account holder, you can top up your or someone else’s UFone number with air time. You will also be facilitated with cash deposit & withdrawal, account balance inquiry and Mobile Account Mini Statement. You can pay the bills of all the national and regional utility billing companies in the country, while sitting anywhere and at any time. These utility billing companies include: 10 electricity supply companies; 2 gas supply companies; 8 Water & Sanitation companies; Wi-Tribe internet and PTCL. The total charges per utility bill payment are just Rs. 5 (including 16% FED). You can not only deposit cash to your UPaisa Mobile Account, but also withdraw it anytime—and all this is just free of cost! A UPaisa Mobile Account holder can easily top up his own or someone else’s UFone number quite easily. Moreover, you can also pay your own or someone else’s postpay bill. Both acquiring a Mobile Account Mini Statement and getting information about your current bill are just free of cost. 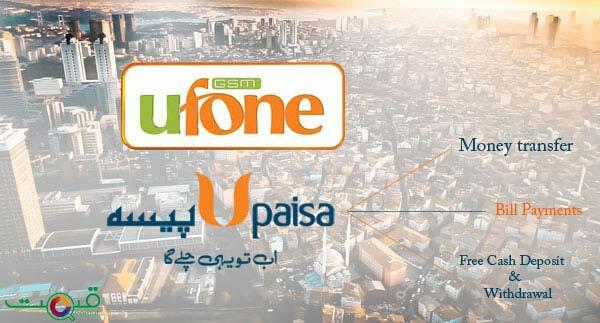 The two things you need to open UPaisa Mobile Account are: (a) UFone SIM, and (b) original CNIC—that is all! Sign on the Mobile Account Opening Form and affix your thumb impression at the space provided for the purpose. After you have completed the account opening process, you will receive an account opening confirmation SMS within just 3 hours. For accessing your mobile account, you just need to dial *786# from your mobile.